I'm a great fan of the wildwest movies, they always capture my imagination: the legendary American railroad, the steam engines, eerie wooden stations, cowboys, horse carriages, guns...its a quivering feeling. And there is one place in our own Kerala which pretty much mimics those wild-west attributes in all aspects: the Kochuveli Satellite Railway Station. Before I start, let me clarify one thing. It is grossly unfair to compare Kochuveli with the similar small-town railway stations in Kerala like Kayamkulam, Kasargode or Mavelikkara. 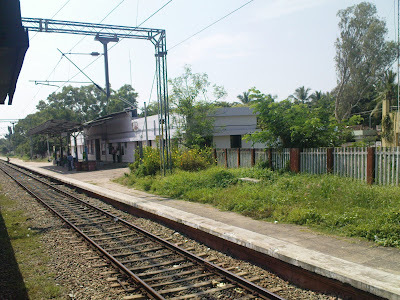 Kochuveli is a place where at least a dozen trains originate/terminate. In the longrun it will share the spoils with Trivandrum Central (TVC) which is fully saturated and is space constrained. In a nutshell, according to the plan the Kochuveli Satellite Station will be as important as TVC. Well, that was the hope when the station was inaugurated by the then CM Oomen Chandy in 2005, after Minister O. Rajagopal, the man behind many of the Rail developments in Kerala, proposed the idea for the satellite terminal. 5 years down, and Kochuveli has turned into something like a nightmare for the passengers and authorities alike. Oh the plans are so grandiose that your eyes will pop out. Kochuveli is planned to be the largest railhead in Kerala. Once finished it would consist of 11 platforms and 11 pitlines, almost double the size of the current Trivandrum Central station. Kochuveli also features in the idea of a rail-head along with Nemom and TVC. To add on a 1.5 million sq ft, 9 storied ultra modern station building is also planned. Elevated platforms to avoid congestion, nine-storey station building with waiting hall, big concourse and 11 platforms are the highlights of the master plan worked out for the development of the Kochuveli Railway terminal. Eleven platforms, 11 pit lines and 11 or 12 stabling lines to cater to the needs of maintenance of the rakes have been proposed. The proposed station building will have a big waiting hall, reservation centre and a host of passenger amenities. Three platforms would be built at more elevation to cater to incoming trains. Three platforms will be at a lower level to cater to passengers of outgoing trains. The eight-metre elevated platforms, first of its kind in the State, will help avoid the rush of passengers. The platforms would 10-metre in width and 630-metre long. This would help accommodate 26 bogies and 5,000 passengers. The existing road from near the `English India Clays' to Kazhakuttom-Inchivila NH 47 bypass would be widened straightened. The Railways will construct a road over bridge later to replace the existing level cross near the `English India Clays' to ensure the smooth flow of vehicular traffic. The Railways will be able to handle 25 trains from the terminal when it is fully developed at a cost of Rs.80 crore. K, essentially we're promised something similar to an Airport when this is complete, fingers crossed, but at present this is something very similar to the 1895 outback stations in Arizona. The pictures tells the whole story, so I'm not taking pain to elaborate more..Here goes the present in full bloom. Current Station Building and the "green" pathway leading to the station. Approach Road to the station. As I said, nothing much to showcase. You'd imagine 5 years is long enough to put up decent services for the paying public but it seems not. As mentioned, the plans are all in the air. Construction of Platform #2 has commenced in Kochuveli but it wouldn't solve the current travails. The Railways feel that once a passenger is out of the terminal their responsibility end. The Corporation behaves as if its not their problem that the passengers to/from Kochuveli is all abandoned in the middle of nowhere once they alight from the train. The location of the station is a classical wildwest location; ill-lit, creepy, outbackish and dangerous. I'm not sure about the technicalities, but connecting the current platforms and station to the old station on the Veli side appear a feasible option. 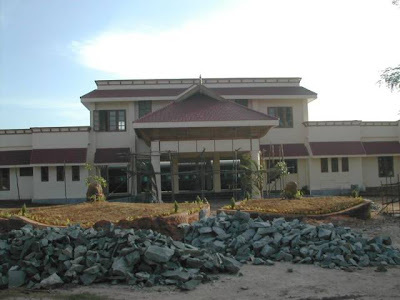 The road connecting the old Kochuveli station (All Saint's College- Veli Road) has good road frontage and is served quite frequently by City bus services to important city points. It baffles me as to why for the past 5 years this was not done in-spite of repeated solicitations by media and the public alike. Currently, passengers including women and children illegaly and precariously negotiate the dozen-odd tracks and stationed wagons to reach the old station on the Veli side to connect to the city. The state of the NH Bypass is another factor that creates spillover problems for Kochuveli. The Bypass Road is largely unlit even when the traffic along the road is bursting at its seams. And the Corporation, as ever, is fast asleep. KSRTC has issues with scheduling their services to Kochuveli given the punctuality of Indian Railways. Earlier this week one Minister had a pragmatic idea about informing the KSRTC when a train reaches Kollam Jn, so that they can be ready with the bus in time. The hapless passengers arriving at the station in the wee hours of the day or at night have just the autowallahs for their recue, even if they're ruthless when it comes to the greenbucks. No Police outpost or even a Polieman in sight at most times, it's not a place you want your sister or wife to set down. It's incredible that those concerned choose to take a blind eye to the issues raised here. Or are they waiting for the blood to spill and then jump out with shock from under their sheets? That's always been our style. TRIDA and the Corporation are talking about planned urban development of the Kochuveli area which surely will revolve around the Satellite station. So far nothing concrete has transpired, and the travails of the general public continues with the lack of basic amenities. Kochuveli provides a golden opportunity to show the world that meticulous town planning is not Greek to us. Apart from the prospects of a large rail head, the terminal could well be developed into a new transportation hub for Trivandrum with an intergrated City Bus Terminal or a satellite terminal for long distance buses. It wouldn't be a bad idea to relocate that Clay factory polluting the environment to the outskirts and the land pooled for the sation development. If ever a Railway Zone is alloted to Kerala, we needn't run frantically in search for a suitable spot. Moreover there is the mesmerising Veli lake and TS Canal frontage for this stretch of land which further opens up more possibilities. But what we need as of today, is an option for a rookie backpacker or a mother with a child or a North-Indian techie coming to Technopark to reach their den safely without being subjected to tachycardiac experiences.